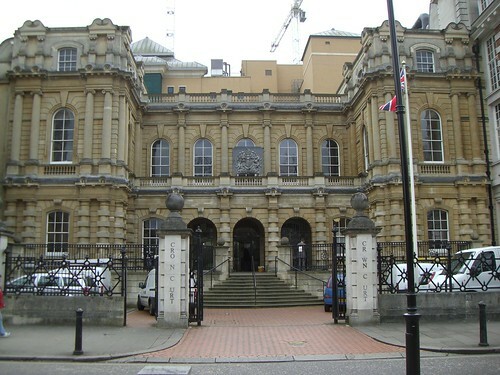 In the UK the crown court is a criminal court. The security guards asked “are you coming in or not?” to explain my loitering “I’m a tourist, can I come in? I have a camera” they helpfully direct me to check my camera into their lockers. Without a camera I felt naked. Wendy: can you recommend a court with an interesting case? The bewigged and besuited ladies started discussing the merits of the various court rooms. I wandered off to court 1 to discover an appeal against the police-revocation of a gun licence. The appellant had originally declared his previous criminal conviction for car theft when applying for, and receiving, the original gun licence. The police admitted that they had not checked how the stolen car was subsequently used – in an armed robbery. The police had new information that they believed made giving the appelant a gun licence a very risky proposition. The appellant’s right to natural justice required that their appeal could address the information that the Pollice used to make the revocation decision. The police did not want the appellant to know the information they had used in this judgement. This case was unique and the lawyers introduced lots of similar, yet different cases as they discussed how to proceed. The judge appeared genuinely concerned about the appellants ability to exterminate vermine being curtailed by having his gun licence revoked. The witnesses giggled. In the courts people wore wigs, held bibles above their hearts and swore poetic oaths, bowed to the judge, debated points of law. All dressed ‘well’, even the juries. I was undoubtebly the scruffiest person in the building in my anachronistic mountain equipment jacket. This scribble was published on Friday, November 23rd, 2007. You can follow any banter on this scribble with the RSS 2.0 feed. You can leave a response, or trackback from your own site.